The OfficeMax Promotion last week was great! I didn’t make it to as many OfficeMax stores as I had hoped, but it was an interesting experience regardless. Let’s start from the beginning. On 3/2/14, the day the promotion started, my wife and I went to our local OfficeMax store (which I will refer to as OM1). When we got there and tried to buy 10 – $200 cards (5 each) the promotion was not working. I checked Twitter and everyone was having issues nationwide. The cashier was very helpful though and offered to hold the cards for us until the promotion was working again. The next day, 3/3/14, we got a call from OM1 saying that the promotion was up and running. That was great, but that store is not very close to my workplace, so we decided to wait until after work to go pick up our cards. There is, however, a different OfficeMax (OM2) located near our workplace, that we decided to visit at lunch. When we got there a fellow MSer was in line buying 9 – $200 cards ($1,800). That is the magic number of cards at OfficeMax, since $2,000 worth of gift cards triggers a SAR. The only problem was the manager at OM2. She was insistent that this MSer had to fill out a SAR to buy these gift cards. So, she spent about 10 minutes trying to find the form which she never ended up finding. She finally allowed this MSer to buy those cards without filling out the form, since she could not find it. After he finished his purchase, I was finally able to buy my gift cards. They rang up all 9 – $200 cards, then I swiped my card and it was denied. There is nothing more annoying than a credit card being declined. So, i stepped off to the side to call Chase and have them release the fraud warning. When I did, my wife started her purchase of 9 – $200 cards. The manager rang them up and saw that she was using the same business card, except for it was under her name. When she saw this, she freaked out and said that I needed to fill out a SAR form since the accounts were linked. I was still on hold with Chase while she started looking for this form again. After another 10 minutes of her not finding this form and me still on hold with Chase, I decided to leave. I did not end up going back to this OfficeMax, because the manager was very to annoying to deal with. After work we went to OM1 to pick up the gift cards we had waiting for us. When we got there, the manager rang them up and we were on our merry way within 5 minutes. The difference in managers from OM1 and OM2 was like night and day. We ended up going back to OM1 on 3/7/14 to grab a few more gift cards, but they only had 4 – $200 gift cards left. So we grabbed those $200 gift cards and 12 – $100 gift cards. $100 gift cards are much more annoying to liquidate, but the deal was too good to pass up. It helps that we have a very cooperative Walmart right near OM1. The last OfficeMax (OM3) I visited was on 3/8/14. They had 9 – $200 gift cards left, which I was very excited to buy. Unfortunately, Jenni was not with me otherwise we would have grabbed some $100 cards as well. When I went to check out, the cashier did not know exactly what she was doing, so she called over a manager (That is never a good sign). He started scanning them and realized I had more than the “Two offers per customer” limit. He took 6 of the cards away and only let me buy 3 – $200 cards. I didn’t argue about it, because it does state that in the terms, however it was disappointing that I couldn’t get all 9 of the cards. I ended up earning 22, 598 Ultimate Rewards Points and $80 from this OfficeMax deal, so it was still a very profitable experience. I have talked about the JH Preferred card before, but I think I was a little harsh on it. I have been using it throughout this month and have yet to be shut down. The trick is to be very cautious with this card. I use it to buy money orders and cash advances primarily, however I do mix in a pack of gum every once in a while. I also try to spread out the reloads on this card, instead of maxing it out on the first 5 days of the month. I may just be lucky, but this has worked for me. Has anyone else been shut down yet? I recently got access to a Serve account, thanks to my father, and I love it! It works just like Bluebird since you can load it with Vanilla Reloads and use the same Bill Pay System. The best part about it, though, is that you can load Serve straight from a credit card at CVS. This helps avoid fees entirely. Another perk they are offering right now is a $50 bonus after two $250 direct deposits and a $20 bonus when you send your tax refund to the card. It works so great, that I am thinking about switching my Bluebird account to a Serve account. 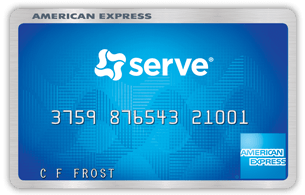 You can find out more about Bluebird and Serve here. Recently, I was informed about an issue with my commenting system (Thanks Jason!). I have since deleted the plugin causing the issue, so the commenting system should work like it is supposed to now. If you find any issues with my website, please contact me.